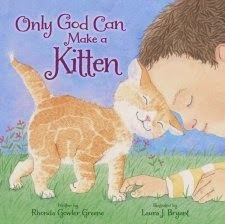 Only God Can Make A Kitten, written by award-winning author Rhonda Gowler Greene and illustrated by bestselling artist Laura J. Bryant, follows a conversation between a mother and child as the child asks "Mama, who made . . . ?" You can find Only God Can Make a Kitten on Amazon, Barnes and Noble and other bookstores. This is such a lovely book to read to any inquisitive child. I know my children ask what seems like a million times a day, who made this and that and how does it work. My kids love kittens and cats so I love that it explains that only God can make kittens and that everything in this world is possible only through God. The illustrations are wonderful and help kids picture what's going on in the book. This is a very cute book that gives God the glory for all His wonderful creations! You can also follow the author on social media.